Joshua "Ben" King and his wife affectionately known as "Mother Theresa" have been teammates in world evangelism for over 20 years, proclaiming a message of hope and healing found through the teachings of Jesus Christ. They have shared God's love with multitudes, face to face, in many nations of the world as motivational speakers and by authoring several books. Art such as oil paintings and a simple potter's wheel have greatly multiplied the Kings opportunities to bring the life-changing message of Christ to places most missionaries would not be welcome. 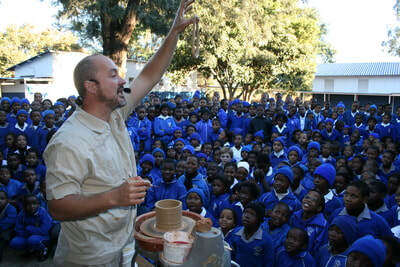 For 15 years the Kings resided in South Africa where Joshua "Ben" King became known as the "Pilgrim Potter", crisscrossing Africa in crowded stadiums, dusty villages, and bustling market places, powerfully sharing Christ with a potter's wheel such as is found in the Book of Jeremiah chapter 18. It was during this time in Africa that the Kings began to deepen their creative gifts, exploring stained glass, large mosaic murals, and inspirational oil paintings. Their art has quickly become sought after by those who have a keen eye for the collected artists of the future. Theresa and Ben both had prepared for careers in business and were working in the investment's industry when they met. As devoted Christians they found that they were not motivated by fame or fortune but wanted to live a purpose driven life that would intentionally cause them to follow in the footsteps of the greatest life ever lived--that of Jesus Christ. After serving as a pastor of a homeless shelter for three years, the Kings sold their belongings, even their wedding gifts, gave them away, and began traveling to different countries sharing their faith and praying for the sick with startling results. Sensing a call to Africa, they moved with their family, now including a ten-month old daughter, to South Africa on a one-way ticket and $500 in monthly sponsorship. It was a humble beginning that would eventually affect the lives of tens of thousands of people. It has been their single minded passion for Christ and seeing lives changed that has kept them going now for over 20 years. Tens of thousands have accepted their message of hope in Christ and they have become known as some of the most effective evangelists working today. 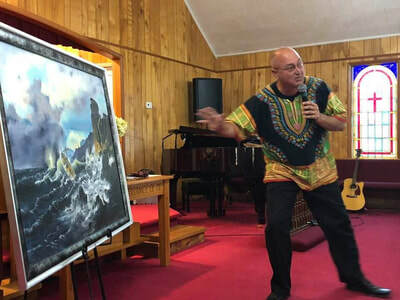 Their devotion to "Reflect God's Light" has infused already gifted artists with something that transcends the ordinary and caused them to become highly sought after by those that appreciate art and want to invest in art that already has a growing reputation in the art investment world. Throughout their artistic careers, the Kings have not only supplemented their own missions work of church planting, evangelism, and orphan relief, but have donated commissioned works to provide for other worthy causes such as Bible Colleges, Shriner's Hospitals for crippled and burned children, Monasteries, and even fellow missionaries struggling to raise their funds. Ben and Theresa, through the gift of their art, have been able to contribute far beyond what the traditional meager salary of a missionary family would allow. They have always seen their art as a natural extension of their family's faith and commitment to each other and to Christ Himself. Their art is a refection of the light that inspires them which often translates into peaceful, romantic, and tranquil settings on canvas or clay. Art that captures the inspiration of nature and even often contains hidden scriptures or symbols, transports an ever growing list of collectors to a place of simplicity and wonder. As more and more people become aware of the Kings and are enjoying their art, it seems their goal of a purpose driven life to "Reflect God's Light" in a dark world is becoming a powerful phenomena. 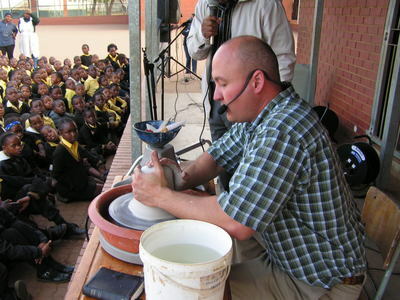 While much of Ben's evangelism centered around preaching from a simple potter's wheel, it has been their oil paintings that have caught the notice of collector's. The King's discovered that they had a diverse creative well that can span many artistic mediums. Like all great artists, they were not content to create in the sense of a "manufacturer" but were driven with a passion to tap into greater rivers of creativity. They quickly incorporated not only the best of nature, but uplifting scripture and symbols to strengthen their blossoming command of colors and shapes. Drawing from their own deep times of prayer, meditation, and fasting they found creative powers surging forth with ideas even coming to them in the form of dreams. Trusting this inspiration has often led them in a divergent path from many forms of post modern art that can seem to reflect a chaotic universe and a tortured human experience. By forging their own authentic path and developing their skills to reflect the light and hope they see in the world they are being recognized and sought after for their contribution to the world of art.